In Angel Beats, Kanade clearly entered the afterlife before even Yurippe did, yet Otonashi arrived later. Technically, Kanade must've died after Otonashi. Unfortunately, Angel Beats! doesn't go into much detail about the mechanics of the afterlife environment it takes place in. However, if we assume that the series follows the basic concept of eternity, then a partial explanation can be given. The green line is the (main) world timeline where the characters in the series lived their lives before they died. The red line is the afterlife timeline where the characters went when they died and where most of the series takes place. The cyan line is the alternate world timeline where (I presume) the characters in the series went after they've resolved their issues and regrets in the afterlife and moved on. The white circles/ovals represent the time Kanade Tachibana spent on a timeline. The blue circles/ovals represent the time Yuzuru Otonashi spent on a timeline. 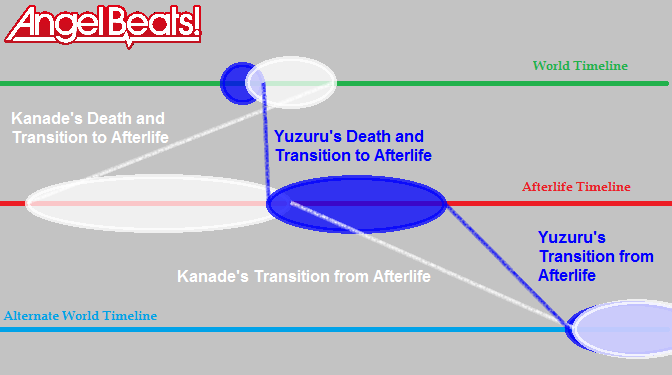 The white lines represent Kanade's transition from one timeline to another. The blue lines represent Yuzuru's transition from one timeline to another. The ranges of the circles/ovals are rough estimates. Yuruzu gets in a train crash. Although he survives the initial crash, he eventually dies of thirst. Just before he dies, he signs an organ donor card. Because the rescuers arrived just barely too late, his organs could be harvested in time. Kanade is in need of a heart transplant. She receives a donor heart. It is Yuzuru's. Kanade dies. We don't know how long she lived after her heart transplant, but, it apparently saved her life, so I presume she lived a good while after it. Kanade arrives in the afterlife. As per Yuri, Kanade was there before she arrived, but, we're never told for how long, so, the amount of time she spent there from her arrival to her departure is unknown. Events in the Angel Beats! Heaven's Door manga take place. Yuzuru arrives in the afterlife. Kanade and Yuzuru finally meet in person. She stabs him in the chest and notices that Yuzuru doesn't have a heart. She then realizes who Yuzuru is. Events in the Angel Beats! anime take place. Kanade moves on from the afterlife after thanking Yuzuru for the heart he gave her. As per Angel Beats! : Another Epilogue, Yuzuru remains in the afterlife for an undisclosed amount of time helping others move on. Events in the Angel Beats! anime sequel (if ever released) could take place here. Yuzuru finally moves on from the afterlife. Yuzuru gets reincarnated/reborn in the same universe that contains the main world timeline, but on an alternate and better timeline. Kanade gets reincarnated/reborn in the same universe that contains the main world timeline, but on an alternate and better timeline. Yuzuru finally meets up with Kanade and they live happily ever after. Like I said, the series never really explains the finer details of the afterlife and what exactly happens when someone moves on. This is the best explanation I can give you at the moment. Perhaps some more light will be shed on this matter in the future. In addition to Lunar Guy's explanation, my theory would be that, even though Yuzuru died first, the rate of their transition is different, it probably took Yuzuru a long time to transition between two timelines than what it took Kanade. That's why Kanade arrived first, rather than Yuzuru. To support this, Kanade's regret was that she could not thank the person who gave her his heart, so I'd assume that some form of higher system craftily planned for Kanade to arrive first rather than Yuzuru, so that she could fulfill her regret and move on. Otherwise if Yuzuru arrived first, there would be a risk that he would move on first, making Kanade's regret unfulfilled, leaving her stuck in the Afterlife. Otonashi moves on, since he died without any regrets. He doesn't end up in the afterlife school thing. Kanade dies and ends in the afterlife school thing. Kanade wishes to thank Otonashi. Kanade's wish "grabs" Otonashi from his peaceful slumber and throws him into the afterlife thing. I suspect that this place is designed specifically so people can find happiness, and since Kanade's requisite was to thank Otonashi, the place took him back temporarily. Otonashi, upon arrival, loses his memory since he was taken to this world in a not-conventional manner. Events in the anime occur. The reason Otonashi didn't end up in the afterlife school upon death, is because he didn't really die with regrets. His own theory was that he simply "forgot" and thus ended up in the school, but that doesn't make much sense. Instead, he moved on, rested peacefully for a while, and then Kanade's wish brought him to the school. Otonashi died (signing first his organ card). His organs are donated to different people (for instance, his heart went to Kanade, while his other organs went to a John Doe). Kanade lived for a while (long or short), but regretted the fact that she couldn't thank Otonashi. Eventually she dies. Kanade appears in the afterlife and starts acting like the "angel" after learning the purpose of this world. John Doe dies and so Otonashi now is completely dead. Otonashi appears in the afterlife with amnesia (this really isn't that weird considering Yurippe said it's normal, or you could also say that he was dead for so long that he forgot most of his life). I imagine the time it takes to transition into the after life = the number of regrets. The simpler the regret, the faster it takes to get to the after life. Kanade's regret was just to thank the person who gave her the heart, while otonashi'a regret is more complicated because he had no regrets, but he didn't know. Hideki came into the after life before Yui because his regret was just to catch a ball, while Yui was multiple things she saw on TV. Time of death does play a role, but I think second to the kind of regret. Yui could have died before Hideki. Otonashi died. Bug caused him to land in the 'school'. It's a place to fulfil regrets, in real live of afterlife (this is a bug by itself actually). Felt in love with someone and realized it shouldn't be sustaining. Created Angel Player program to turn himself to NPC and thus erased his afterlife memory. Kanade got the heart in real life. Died and due to fate got hold of the Angel Player. Angel Player has the ability to turn NPC back; with certain conditions I presume (this is assumption). Otonashi got back his soul. Otonashi fell in love again. The cycle should continue until he finds another love. What if time in the afterlife traveled in reverse, compared to the "real" word? Then all the characters would be able to die and immediately travel to the afterlife. Note: When I re-watch the series, I will look for supporting facts. At the moment, this is only a theory. This answer may be wrong, but possibly Kanade was in a coma awaiting a heart transplant. Yuzuru died a bit later and donated his heart to Kanade. It'd make sense because Kanade has Yuzuru's heart in her. The surgery must've failed and she ended up dying, so that's why she remains in purgatory. Remember when Otonashi signed that organ donor card before he died? Angel was given his heart because she needed it and came to the afterlife to thank Otonashi for his heart. Not the answer you're looking for? Browse other questions tagged angel-beats or ask your own question. What happened to Otonashi and Kanade in the last episode? Why couldn't Otonashi of Angel Beats pass on? Can we roughly determine the dates and duration of Otonashi's stay in the Afterlife World? Why does Shiina always say “how shallow-minded”? Is there any connection between Otonashi and the first NPC? How is it possible to take 7 days to rescue the trapped survivors in the train crash? How do Otonashi and Kanade remember Iwasawa's last song in their next life? Why did Angel and Otonashi want to pass on and make others pass on?